This op-ed was originally published also in the Middle East Eye. 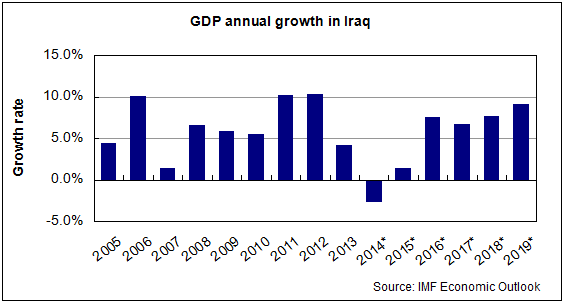 Dramatic events in 2014 have put an end to 10 years of robust economic growth in Iraq. The effects of political turmoil and violent conflict that quickly spread through the country are seen in key macroeconomic indicators, as highlighted by the International Monetary Fund in their latest economic outlook for the Middle East. Iraq’s GDP is estimated to contract by 2.6% for 2014, after an annual growth of 5% to 10% since 2004 —with the exception of 2007. Even Kurdistan, which is considered the wealthiest and most stable region in Iraq, will not be able to escape the crisis, with a deceleration of the region’s growth rate from 8% to an estimated 3% —although still growing compared to the rest of Iraq. The impact of the political turmoil is felt transversely through the economy, with ISIS appearing as the main destabilising factor in Iraq. A large part of the country, which remains crucial for Iraq’s food security, is out of the control of the central government. Security disruptions are weakening the confidence and purchasing power of families, and hence small businesses are registering a significant decrease in sales. The main trade routes from the rest of the Middle East have been disrupted and supply chains require time to adapt to the new situation. The Parliament of Iraq failed to pass the 2014 budget and public investment had to be massively cut —on which much employment depends— or substituted for military expenses. In addition, around 2 million individuals have been internally displaced, adding pressure to already-constrained public services. Labour market is likely to be negatively affected due to the combination of a lack of employment opportunities and the large groups of displaced people seeking to restore their economic livelihoods. The oil sector has been still thriving in both Kurdistan and Basra despite security problems and a collapse in oil prices, but it is not enough to compensate for such large shocks on the rest of the economy. To what extent is this economic paralysis contingent on political turmoil, after which growth would soon resume? The IMF seems rather optimistic in forecasting that Iraq will be back on growth as early as this year thanks to “further increases in oil production and exports helped by the recent agreement between Baghdad and Erbil”, as pointed out recently by the IMF’s chief of mission to Iraq. However, not only the political outlook may look bleak, but also the economic one. The decade of uninterrupted growth came in spite of a lack of structural reforms. State-building has been based on much of what was already there before 2003. Even the IMF in its Middle East outlook report recognises that Iraq’s model has been dependent on the growth of government spending supported by increasing oil prices. A whole new scenario, starting 2015, should now be contemplated. Economics depend much on prospects and expectations. Without recovering confidence on economic prospects —and this is everywhere linked to political achievements— consumption and investment are likely to remain downwards. In this sense, the IMF forecast is based on assumptions that both the political situation and the oil market are on the right path to stabilisation. However, political developments in Baghdad are highly volatile as disputes over Iraq’s natural resources are both still largely unresolved and a source for new dividing lines. In addition, a thorough solution to the current military conflict is far from being reached any time soon. As plans to liberate Mosul have delayed over time, so does the stabilisation of the country —and it is difficult to evaluate the state of assets and the economic fabric within ISIS-controlled areas, but losses in output are to be expected. De-linked from political developments, oil-dependent Iraq also needs to measure up to a new evolving economic scenario in order to sustain growth. Besides persistent low oil prices, Iraq has to contend with an even smaller private non-oil sector, and budgetary needs 10 times higher than the last time oil remained at $40 per barrel —$13bn in 2004 compared to $150bn in 2014. Iraq’s vulnerability in these terms is highlighted in two ways. The first is the effect on the fiscal position of the government. With oil prices suddenly dropping below the minimum price level required to sustain a balanced budget, the financial architecture of many petro-states has started to tremble. With a threshold of $112 per barrel for Iraq’s finances, the current price of $48 is clearly a huge obstacle to keep the country running. Secondly, the predominance of the oil sector over the country’s GDP tends to slow down the entire economy in crises like the current one. Even other sectors that are a source of growth, such as real estate, depend to a great extent on the money flowing from the oil sector due to the absence of other alternative sectors that can sustain the economy. As a country that failed to create a financial buffer with the wealth generated, concerns now appear over Iraq’s ability to navigate this new economic scenario. Indeed, Iraq’s fund from oil revenues only represent 7% of the GDP, compared to 96% for Saudi Arabia and 222% for Kuwait. This fund should serve as a financial reserve to counterbalance the expected decrease in state revenues, a decrease that must now be balanced by either external funding or budget cuts. How did Iraq reach this ill-prepared position? Successive governments in Baghdad have traditionally considered that the best way to reconstruct the country was to use immediately any oil revenue generated for the budget, instead of putting it apart in a development fund. Only a small fund could be maintained, but has been frequently misused at convenience in an arbitrary and opaque way, such as when former Prime Minister Maliki allegedly used more than half of it last year to pay for the war. 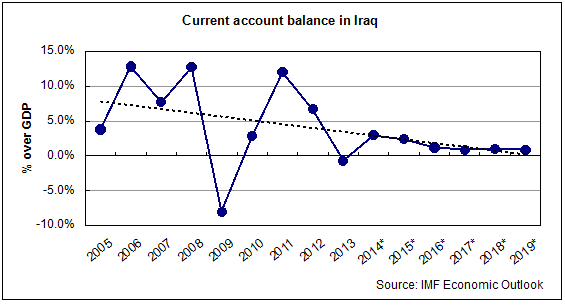 In parallel, Iraq does not hold a large trade surplus by which to accumulate foreign-exchange reserves. Quite the contrary, the value of imports has been gradually coming at par with that of exports as the money circulating into the economy has been increasingly used to purchase finished goods abroad —a visible characteristic of the rentier states. The analysis presented above details how dependent Iraq has become on the outside world and how oil rents have not been properly used for productive investments. Hence the main message to emphasise for economies such as Iraq is to diversify, diversify and diversify. In effect, economic growth may return this year, but the economic weaknesses described above are a reminder of how vulnerable recovery is under shocks such as oil price crashes or social unrest without the development of a robust private sector. Efforts towards diversification seem to have stagnated in the last years, as inferred from the increasing economic dependence on the oil sector and the state budget (see page 21 of the IMF Country Report). Even in what is considered as a seemingly progressive Kurdistan, the Investment Law of 2006 is the only prominent milestone in the whole of the last decade when it comes to developing the non-oil sector. The IMF has been pointing at length to long-term strategies such as investing in education and in solving infrastructure bottlenecks. Short-term actions aimed at improving the competitiveness of the already existing low added-value manufactures can also have a significant impact. For example, supporting local producers on the necessary technological upgrade and modernisation, so as to increase their competitive edge in the face of Turkish and Iranian competitors, could be a way out of the current stalemate. The imports that should be encouraged are the ones bringing in new technology and knowledge. In addition, the investment in expanding the provision of public services —this is necessary due to the humanitarian crisis— can also be a source of short-term growth and employment creation. The Government of Iraq may still rely on a combination of oil exports and international loans to fund these strategies. However, Baghdad will not be able to escape from a re-definition of the public finances. The funding of the public sector cannot go on depending entirely on oil revenues. Not only because these are finite and subject to the international oil price, but also because these revenues are being used for spending that does not promote direct economic growth, such as salaries, instead of capital investment. Public finances will need to rely sooner or later on a new fiscal policy that also incorporates taxation as a source of revenue —and the Minister of Finance has recently recognised it. In addition, tighter rules over the use of the Development Fund saved from oil exports should be encouraged and better enforced to avoid discretionary use. Therefore, to be able to navigate through this new scenario requires a strong willingness to reform and fight against incumbent vested interests. Experiences in other regions show us that weak economies without structural reforms do collapse. So, the year 2015 will require a committed action from the government not only on the political and military side, but also on the economic side, including: (i) addressing the gaps in the economic system caused by the conflict, (ii) formulating a budget that rises to the occasion marked by the decreasing oil prices; (iii) reforming public finances to diversify state revenues and improve its operating capacity, and (iv) improving local competitiveness by promoting productivity upgrades.